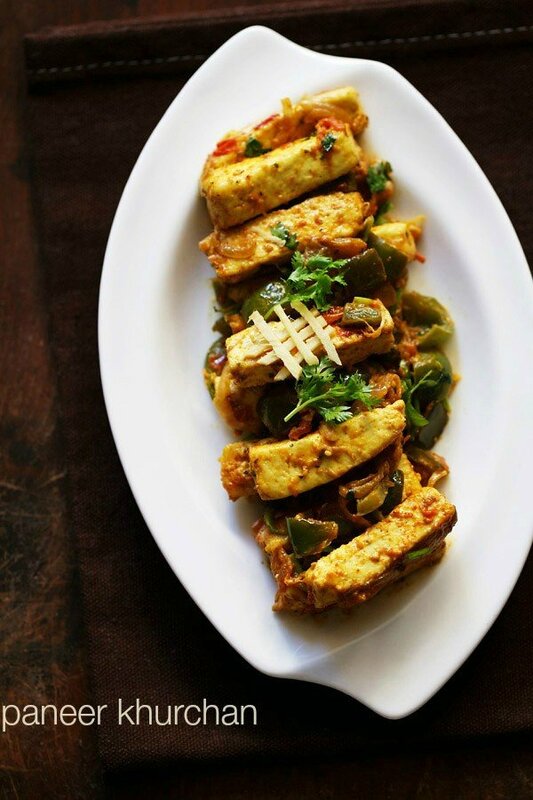 kadai paneer recipe restaurant style - semi dry curry made with cottage cheese, capsicum/green bell peppers and indian spices. 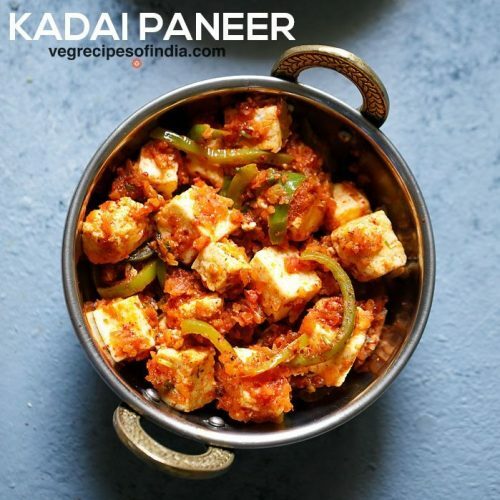 kadai paneer recipe with video and step by step photos – restaurant style delicious semi dry curry made with paneer, capsicum and indian spices. the flavors of this restaurant style kadai paneer recipe comes from freshly pounded coriander seeds and kashmiri red chilies and yes adding freshly pounded spices do make a lot of difference to the food that we cook. 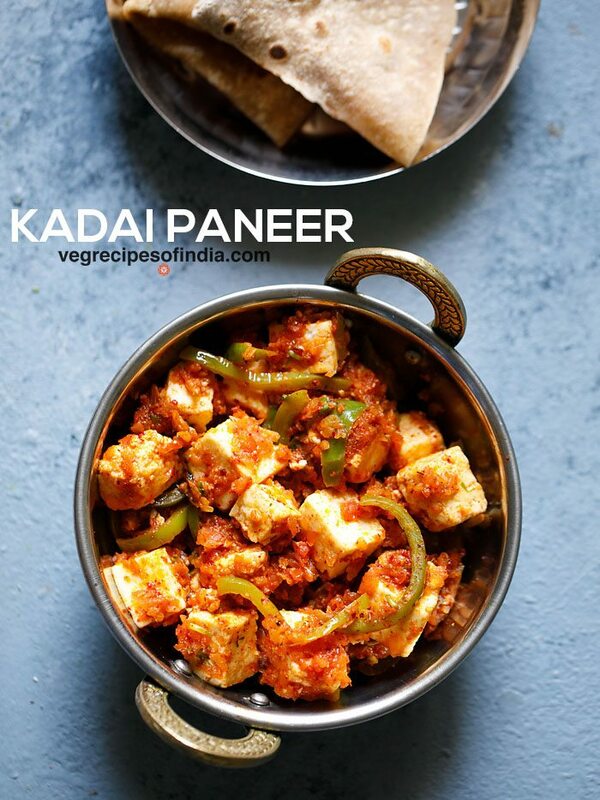 this kadai paneer is one of the most popular paneer recipe on blog along with paneer butter masala, palak paneer, paneer bhurji and chilli paneer. it could be made dry, semi dry or gravy version. 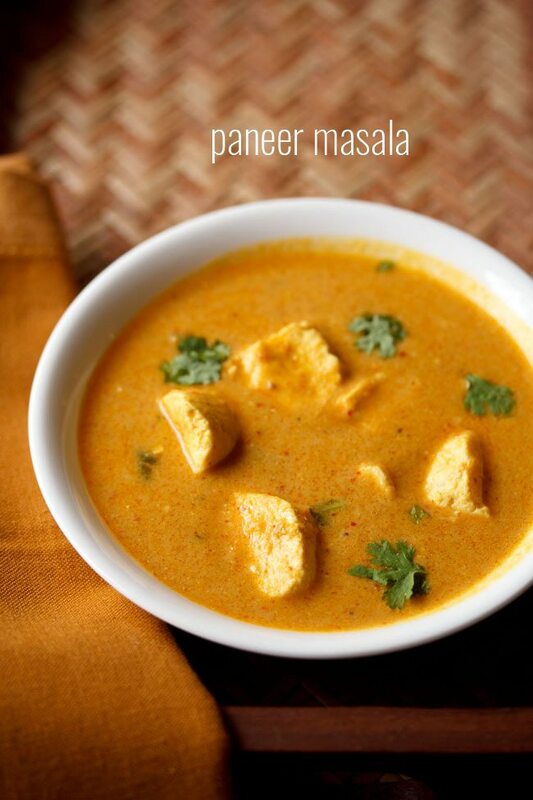 there is also a kadhai paneer gravy version posted on the blog. 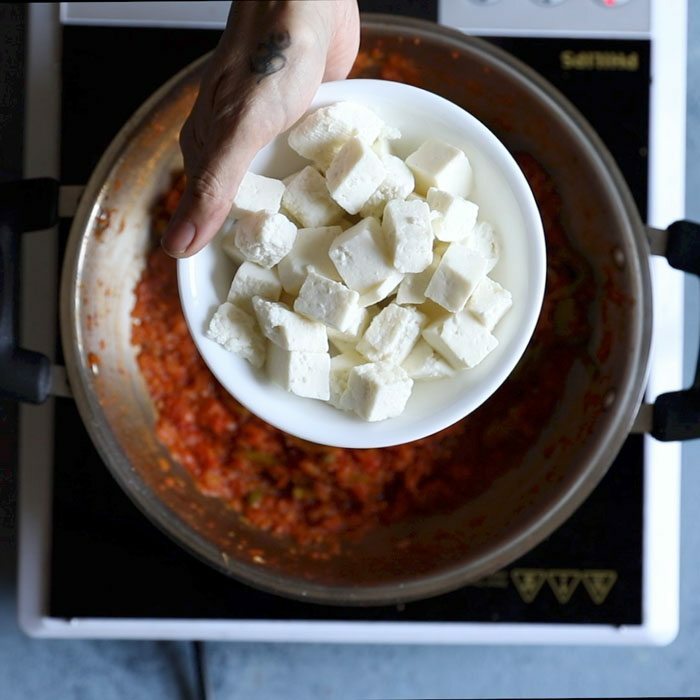 this kadai paneer recipe is a semi dry version. the recipe is simple and very easy to make. 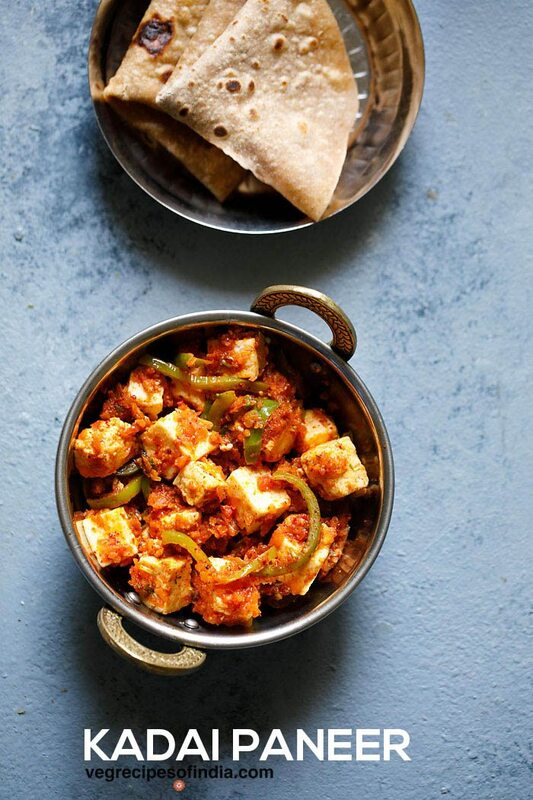 this restaurant style kadai paneer recipe is adapted from the cookbook “prashad – cooking with indian masters” by jiggs kalra. this book has restaurant style recipes, but most of them are non vegetarian ones. a must have book if you want to have some yummy food. i have made a few veg recipes from the book and they have all been great. 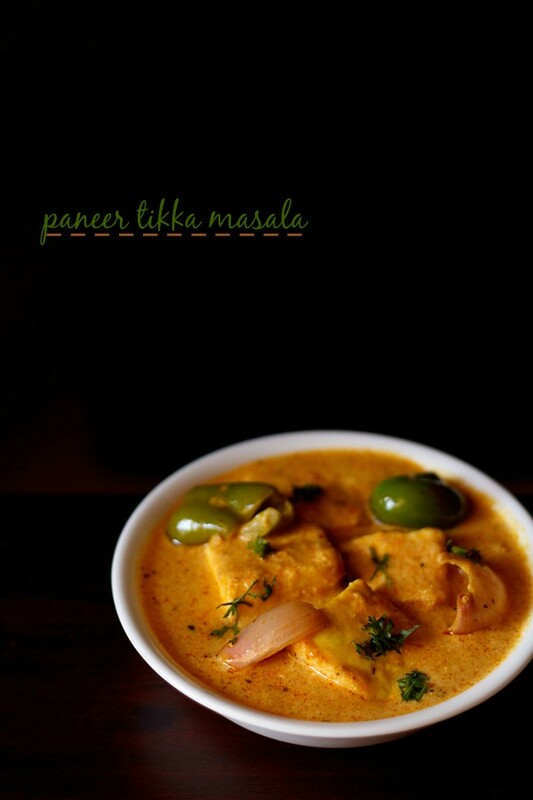 this recipe is called as kadai paneer as the whole dish is prepared in a kadai or karahi. 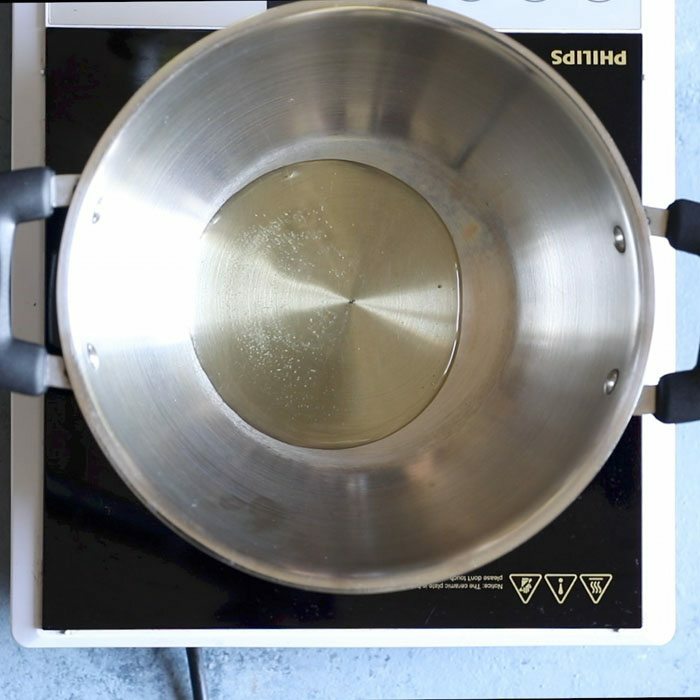 this humble indian cookware which is similar to the chinese wok but with steeper sides. i prefer to use kadai in making recipes which needs a lot of stirring as it is heavy and has a thick bottomed base. if you don’t have a kadai, then make the recipe in a pan. 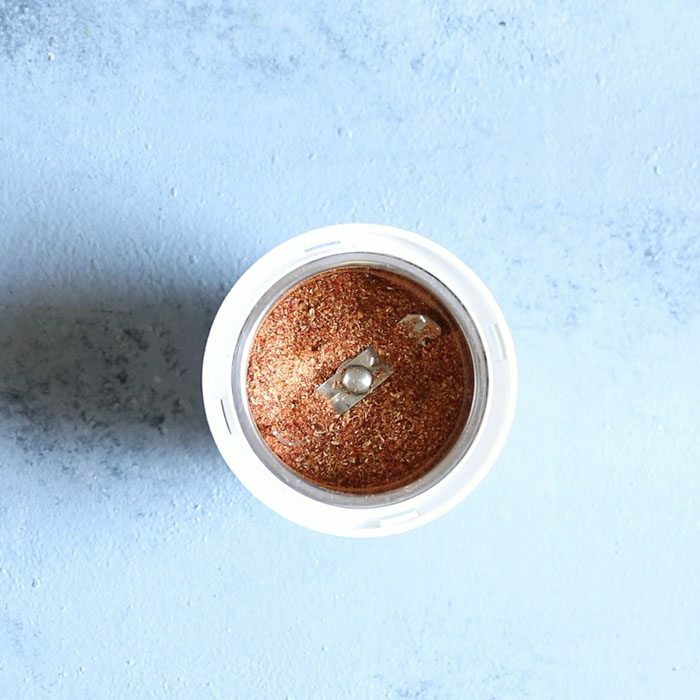 the spices can be easily ground in a small grinder or a spice grinder. 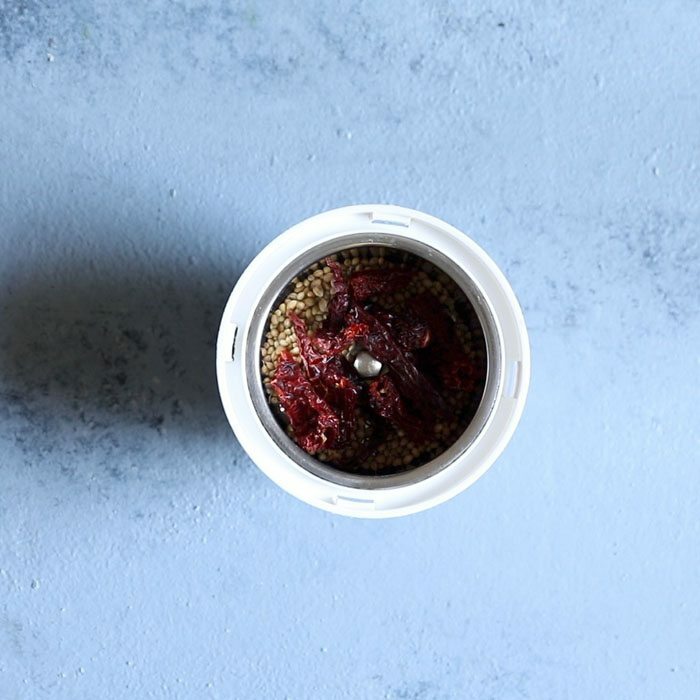 to make the pounding easier in a mortar pestle, dry roast the red chilies and coriander seeds. 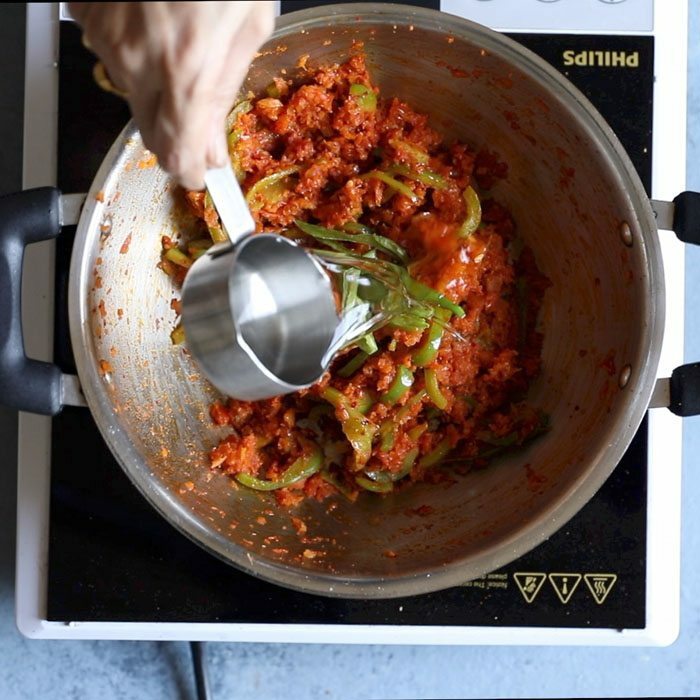 the capsicum can also be diced, but making juliennes means faster cooking. 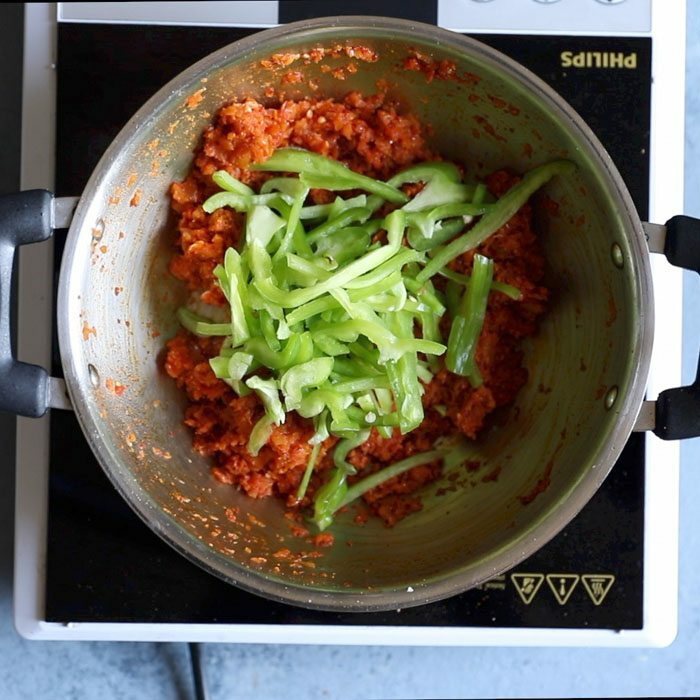 since red chilies are used, one does not need to add red chili powder. 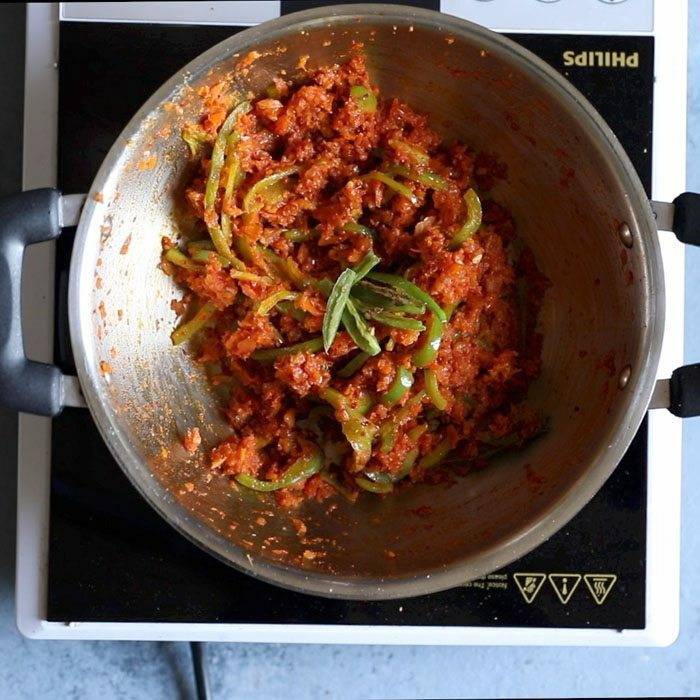 you have to make this recipe in the kadai and not in any other pan 🙂 folks who do not have kadai, use a wok instead. 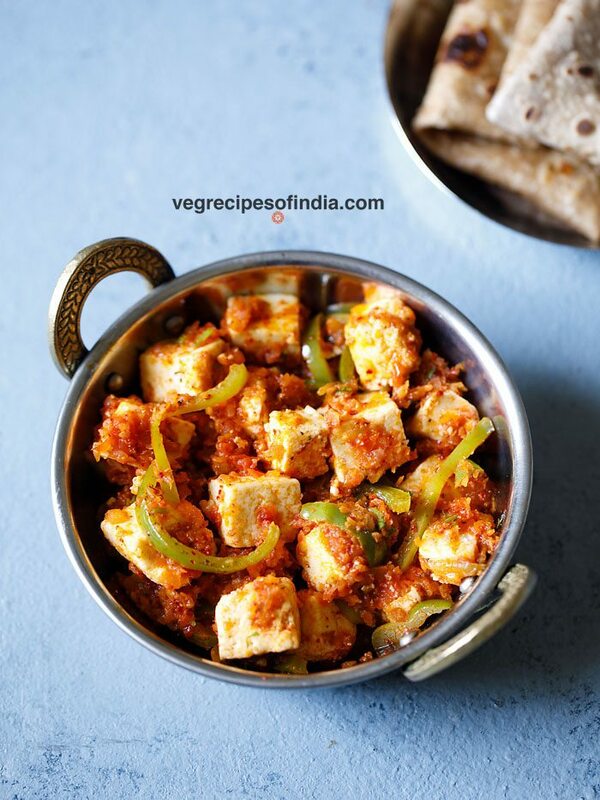 this kadai paneer recipe is a semi dry and mildly spiced recipe. best to have kadai paneer with onion rings, lemon wedges and butter naan or garlic naan or tandoori roti. 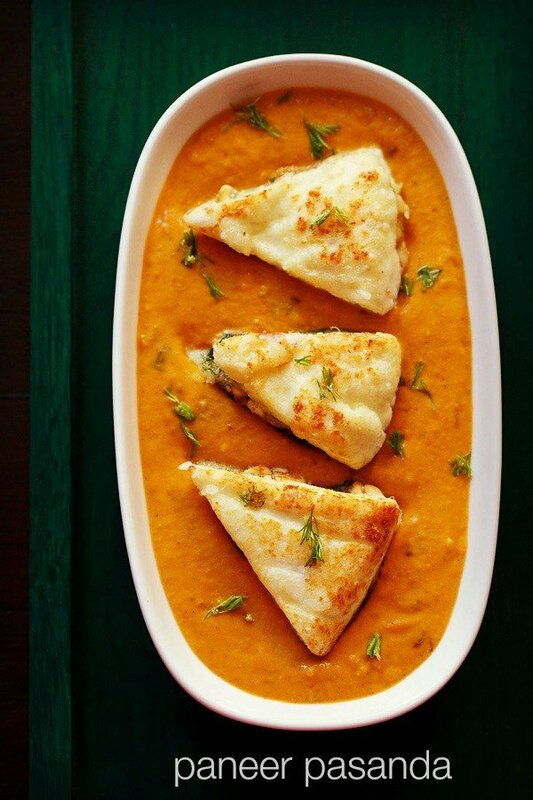 its always better to use homemade paneer for any paneer recipe. once you learn how to make paneer at home then you will not feel like buying it from outside. 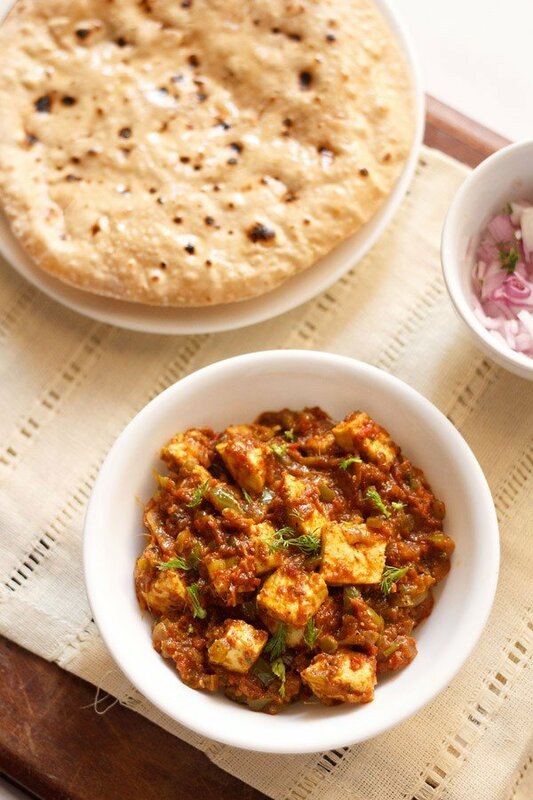 serve kadai paneer hot with rotis or naan or parathas. in a grinder or mortar-pestle take the coriander seeds and red chilies. grind to a semi fine powder. in a kadai heat 2 tbsp oil. add finely chopped onions and saute them till they turn translucent. then add ginger-garlic paste. saute till the raw aroma of ginger-garlic goes away. 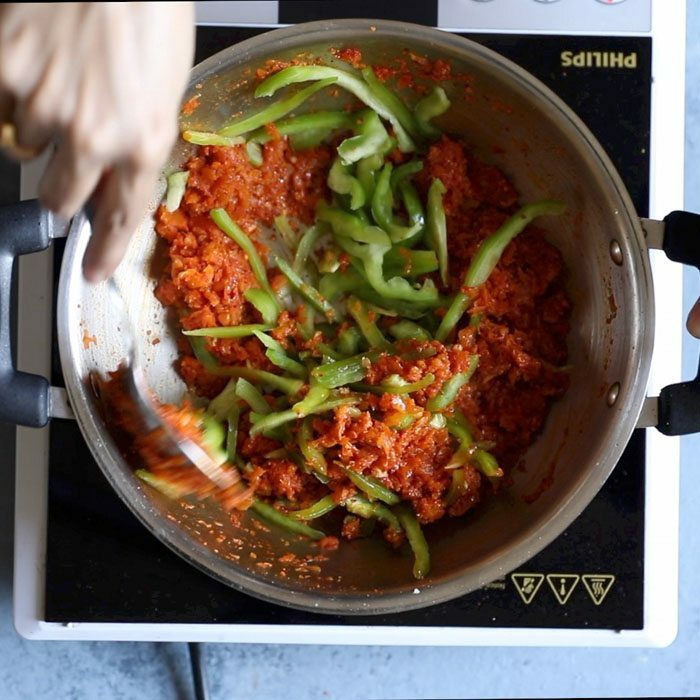 now add the finely chopped tomatoes. saute tomatoes for 3 to 4 mins. 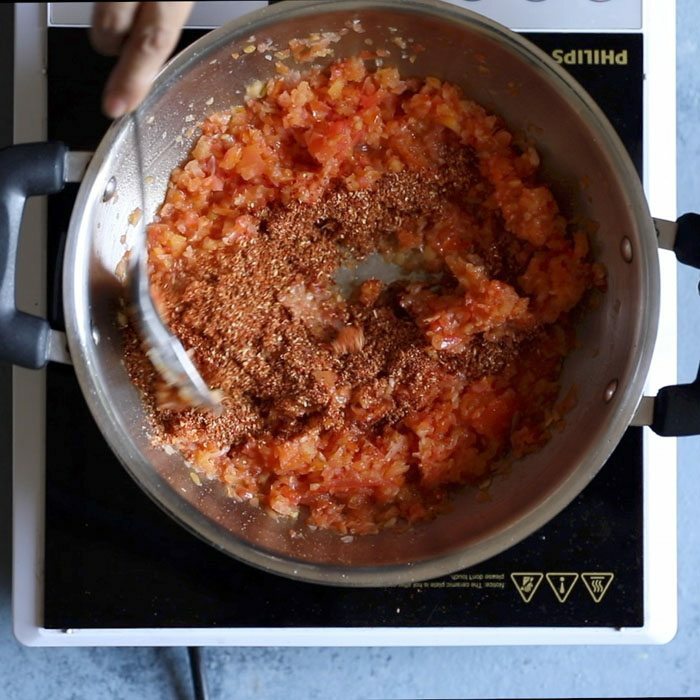 then add the ground kadai masala to the tomatoes. saute the tomatoes till the whole mixture become like a paste and starts to leave oil. now add the capsicum julienne. saute the capsicum for some 3 to 4 minutes. then add green chilies. add water. mix very well and saute till the capsicum is half done. then add salt and garam masala powder. mix these with the rest of the masala. now add the paneer cubes. again mix very well. lastly add kasuri methi, ginger julienne and coriander leaves. mix again. serve the kadai paneer, hot with rotis or naans. 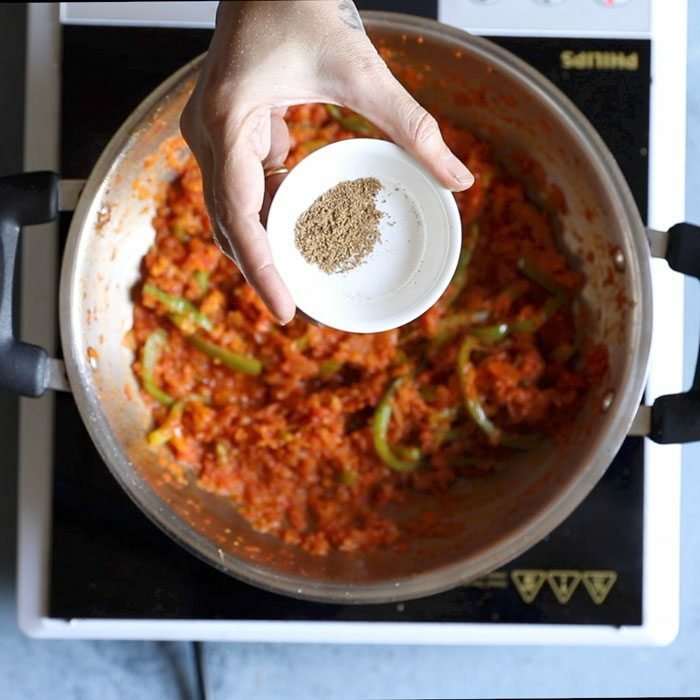 1. in a grinder or mortar-pestle, take 1.5 tablespoons coriander seeds and 5 to 6 kashmiri red chilies. 2. grind to a semi fine powder. 3. in a kadai, heat 2 tablespoons oil. 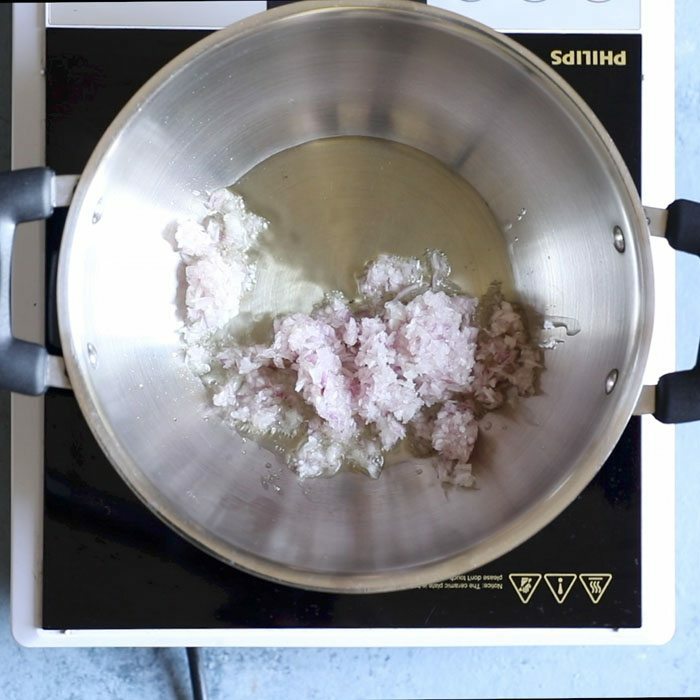 4. add ⅓ to ½ cup finely chopped onions. 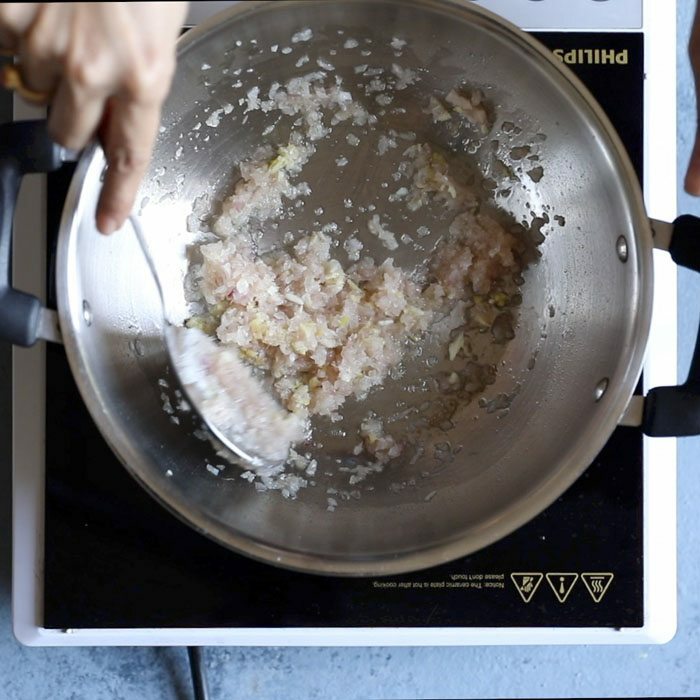 5. saute onions till they turn translucent. 6. then add 1 teaspoon ginger-garlic paste. 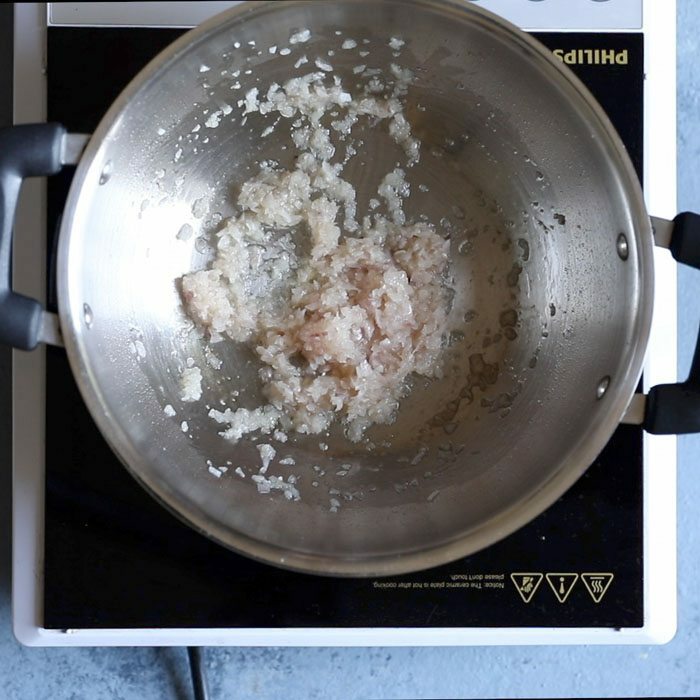 7. saute till the raw aroma of ginger-garlic goes away. 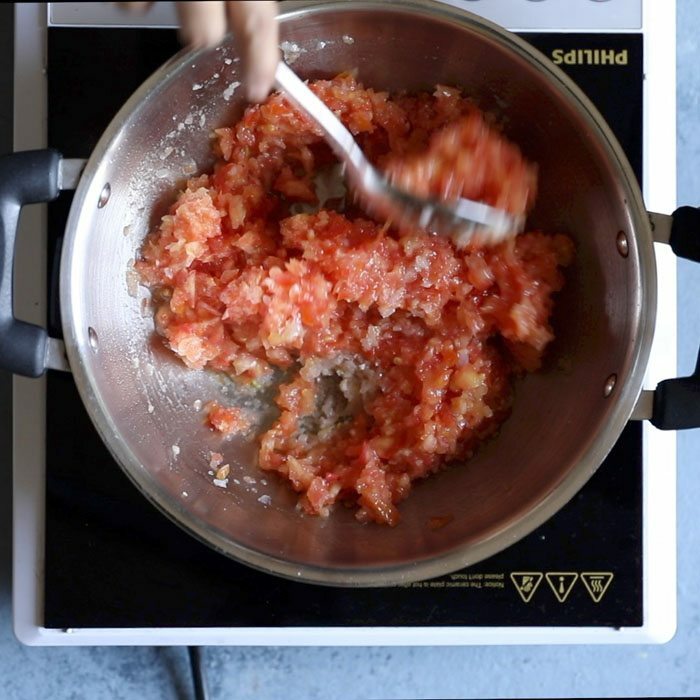 8. now add 2.5 to 3 cups finely chopped tomatoes. 10. saute tomatoes for 3 to 4 minutes. 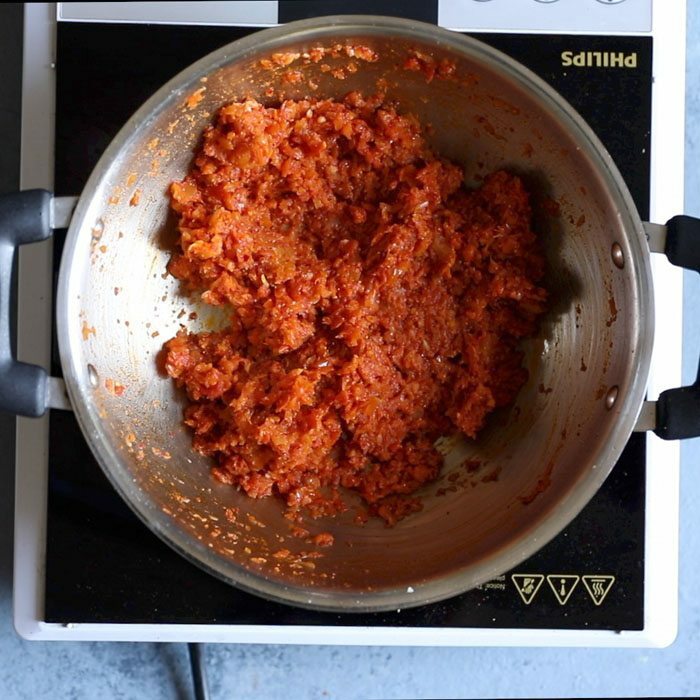 11. then add the ground kadai masala to the tomatoes. 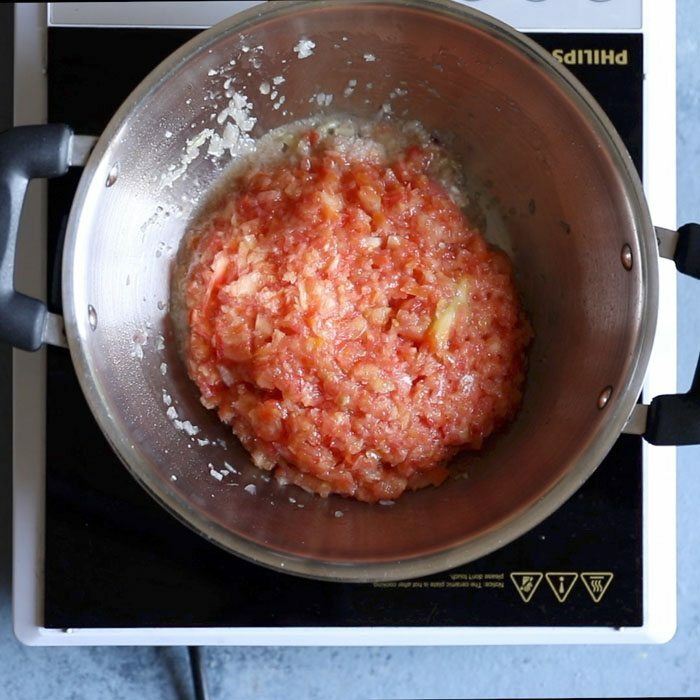 13. saute the tomatoes till the whole mixture become like a paste and starts to leave oil. this method is called ‘bhunao‘ in hindi. 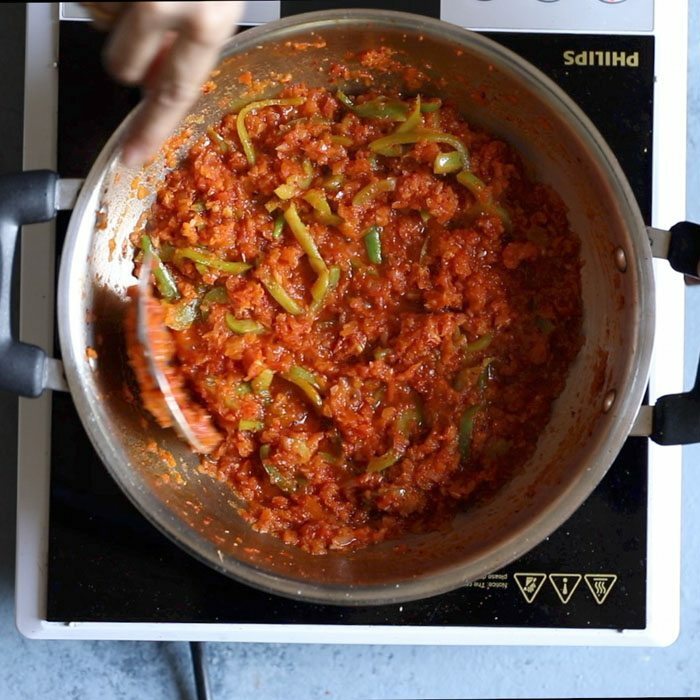 14. now add ¾ to 1 cup capsicum julienne. 15. saute the capsicum for some 3 to 4 minutes. 16. then add green chilies. 17. add ½ cup water. you can add less or more water as required. 18. mix very well and saute till the capsicum is half done. if you want you can cook the capsicum completely. 19. once the capsicum is half cooked, then add garam masala powder and salt. mix these with the rest of the masala. 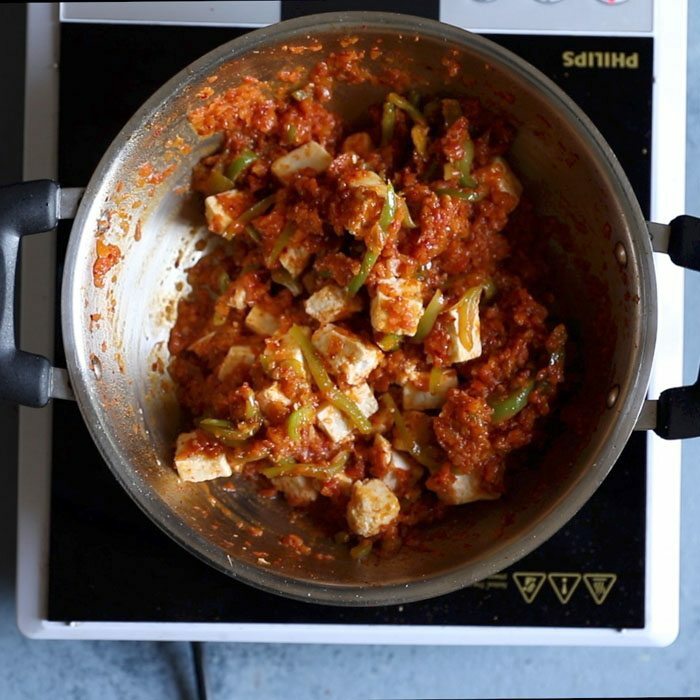 20. now add the paneer cubes (250 grams). 21. again mix very well. 22. lastly add 1 teaspoon crushed kasuri methi, ginger julienne (from 1 inch ginger) and 2 tablespoons coriander leaves. mix again. 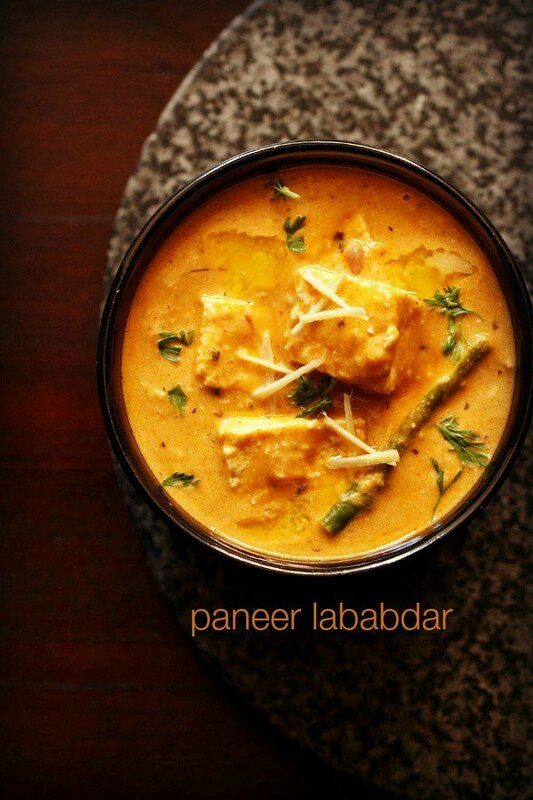 23. serve kadai paneer, hot with rotis or naan or plain parathas or pudina paratha.